Bred in Argentina by Haras Ojo de Agua. Owned by Jorge Azevedo, then A. B. (Bull) Hancock Jr. Trained in the U.S. by Charlie Whittingham. One of the greatest horses in Argentine turf history, *Forli won his three starts at two by margins of 12, 17 and 5 lengths. The classy chestnut colt at three captured Argentina’s “quadruple crown” consisting of the Guineas equivalent, which he won by 12 lengths, the Derby, the Jockey Club, and the Pellegrini against elders. He also caught the eye of Claiborne’s A. B. (Bull) Hancock Jr., who acquired *Forli to race in the U.S. Unbeaten in his native land, *Forli won two races including a course-record setting performance at Hollywood, then placed in Arlington’s Citation Handicap where he was injured in his only career loss and thus retired to Claiborne. For a stallion’s first visit to his paddock, it is customary to have workers posted nearby to wave, shout, and keep the horse away from the fence. Out of a stall and free from the shank for the first time since their weanling days, most stallions will run around the paddock, but heed their protectors and soon settle in to graze. Not this one. With Hancock and his crew watching in horror, *Forli made that first visit memorable as he charged between the shouting men and jumped the paddock fence. *Forli soon settled in for a long and successful stud career. His 60 stakes winners (9% from foals) included Champions Asteroid Field, Sadeem, Thatch and the inimitable three-time Horse of the Year and Hall of Famer, Forego. 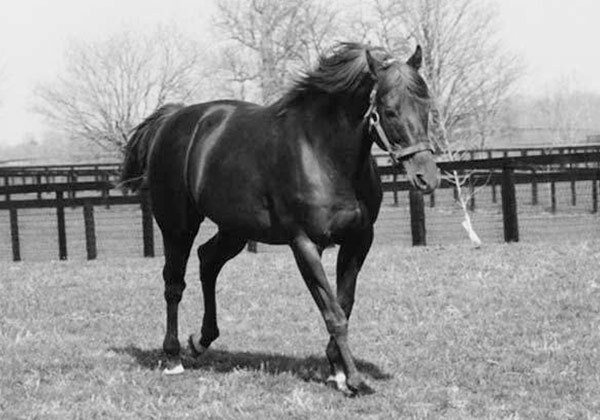 His lasting effect on the breed was cemented by his daughters, including Claiborne’s Special (full sister to Thatch), dam of Nureyev and granddam of Sadler’s Wells. *Forli is also the broodmare sire of Claiborne’s Kentucky Derby and Belmont Stakes winner, Swale, and of Breeders’ Cup Sprint winner, Precisionist.